Chocolate and Fig Panettone for sale. Buy online at Zingerman's Mail Order. Gourmet Gifts. Food Gifts. The unicorn of Christmas cakes. We’ve been enjoying and selling panettone, the feather-light cake eaten across Italy at Christmastime, for more than three decades. 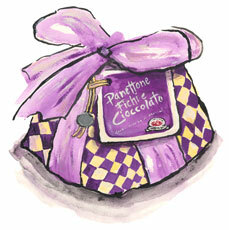 Most panettoni are seasoned with citrus and bits of fruit or nuts, though we also discovered one laced with balsamic. This one takes the classic flavors up to eleven by tucking in luscious pockets of tender figs and bits of chocolate. Wrapped and ribboned, it makes a beautiful gift for a chocolate-and-fruit fan.